If one of your panels or posts become damaged they’re fairly easy to replace, this article show you how. Constructing a fence using fencing panels is very easy. However, should one of your panels, or posts become damaged they’re fairly easy to replace too – You’ll just need to buy a new fence panel or post. 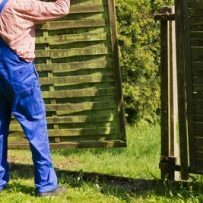 Should you spot a panel in your fencing that is damaged, or a post that is loose, then you should replace it as soon as possible otherwise you run the risk, particularly in a high wind, of damaging the rest of the fence. In my mini-guide below I explain in easy to follow step by step instructions how you can replace a panel, or a post in your fencing. Check if the fence panel has been secured to the post with nails or with clips . It is much easier if fencing clips have been used as these are designed so that you can easily slide the panel out. Because, in this example we’re replacing a post as well, and the adjacent panel is sound, you will need to cut through the nails using a hacksaw blade. Remember that you’ll be using a bare hacksaw blade, so wear heavy duty gloves to protect your hands. Cut the nails down the length of the panel on the post of the sound fence panel and then using a nail bar prise the damaged panel from the other fence post and lift it out You’ll find this easier if you have a friend to help you do this step. Now that your new fence post is in place you can concrete it in. It’s advisable that you use a Rapid Setting Concrete Post Mix. These are used by placing water in the hole around the post and then adding the post mix powder. There are several different varieties of these mixes on the market and all will do a satisfactory job but I recommend you read the manufacturers instructions to get the best results. Concrete posts are available in a multitude of sizes. These are slotted on each side and make it really easy to simply drop in new panels whenever they become damaged, rotted or require replacement for any other reason such as graffiti or defacement.